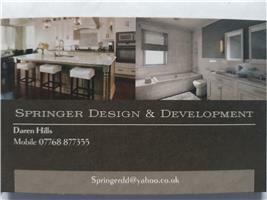 Springer Design and Development - Bathrooms, Kitchens based in Burwell, Cambridgeshire. I have over 12 years’ experience in the services I provide and my aim is to provide a personal, professional and exceptional experience to all of my customers. I am a reliable, practical, creative and hard working kitchen/bathroom fitter with excellent carpentry and joinery skills. My work ethic is of a very high standard and I am able to complete multiple projects without compromising safety and quality while adhering to deadlines. I am experienced in fitting all types of made to measure and bespoke kitchens and bathrooms units. I can also undertake plastering and tiling (walls and floors) work. 20 mile radius of Burwell.